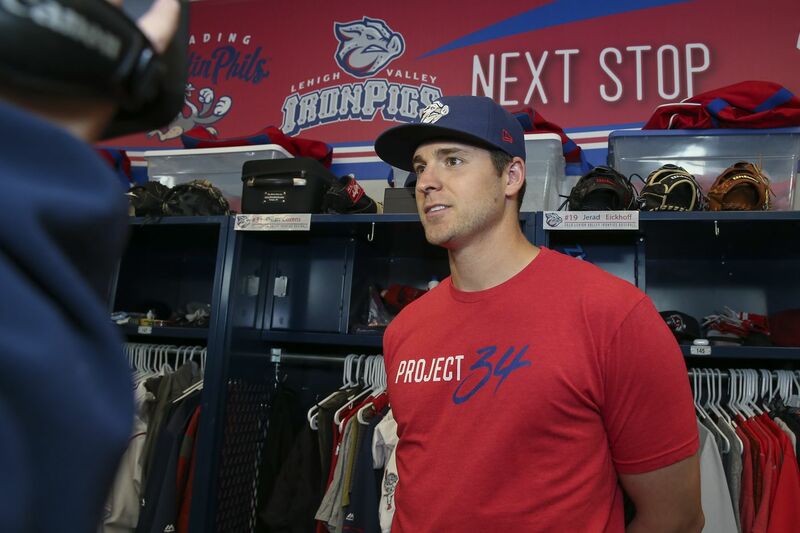 IronPigs pitcher Jerad Eickhoff during media day at Coca-Cola Park in Allentown on Monday. For those who enjoy seeing good, young baseball prospects, the Phillies have their share. There are plenty to view in the organization’s four largest minor-league teams: triple-A Lehigh Valley, double-A Reading, high-Class A Clearwater, and low-A Lakewood. If you’re looking for starting pitchers who could be with the Phillies this year, then the IronPigs are the team to see. They have so much depth that the IronPigs are going with a six-man rotation. Four of the starters — right-handers Drew Anderson, Enyel De Los Santos and Jerad Eickhoff, and left-hander Ranger Suarez — pitched at some point for the Phillies last year. If there are injuries or a Phillies starter falters, any of them could be pitching again at Citizens Bank Park. Anderson had a strong spring, posting a 0.71 ERA in 12 2/3 innings. He pitched five games last season for the Phillies, but mainly was with the IronPigs, for whom he went 9-4 with a 3.87 ERA. De Los Santos was acquired last year in the Freddy Galvis trade with San Diego and became an International League All-Star with Lehigh Valley (10-5, 2.63 ERA). Like Anderson, he is not overpowering and depends on switching speeds. Eickhoff, 28, threw just 31 minor-league innings and 5 1/3 innings with the Phillies last year. He looked strong in spring training, striking out 12 in nine innings, after undergoing carpal tunnel surgery in October. If Eickhoff gets off to a good start, could be the first starter recalled. He has thrown 381 2/3 innings with the Phillies. Another player to watch is 6-foot-4 left-hander Cole Irvin, who was the International League pitcher of the year last season, leading the league in ERA (2.57), WHIP (1.05) and wins. He throws in the low 90s and relies on mixing his pitches. Irvin had a 3.48 ERA in 10 1/3 spring-training innings. Lefty JoJo Romero, 22, is in his first year in triple A. He suffered a season-ending oblique injury in mid-July at double-A Reading. In his last 11 starts, he was 7-2 with a 2.44 ERA. Romero, who had a 1.13 ERA in eight spring-training innings, is the Phillies’ No. 7 prospect according to MLB Pipeline. A player with local interest is Phil Gosselin, a Malvern Prep grad who can play all over the infield. The Phillies are his sixth organization. The biggest story is an outfield consisting of former first-round draft choices: Cornelius Randolph, 21; Mickey Moniak, 20; and Adam Haseley, 22. Moniak and Haseley are natural center fielders, but manager Shawn Williams says each will play all three outfield positions. Haseley is a candidate for a promotion since he played his last 39 games last season at Reading, hitting .316 with six home runs, 17 RBIs and an .880 OPS. Phillies outfielder Bryce Harper talks to teammate Mickey Moniak during the second-inning while the Phillies play the St. Louis Cardinals in a spring training game on Tuesday, March 5, 2019 at Spectrum Field in Clearwater, FL. A player on the Phillies’ 40-man roster is shortstop Arquimedes Gamboa, 21, a slick fielder who needs to improve offensively after hitting .214 at Clearwater. Reading also is home to the Phillies’ No. 1 pitching prospect, Adonis Media, 22. The 6-1 right-hander relies on a mid-90s fastball and struck out 123 in 111 1/3 innings last year for Clearwater. Two other pitchers to watch are right-hander Mauricio Llovera, 22, whose 137 strikeouts (in 121 innings) led the Florida State League, and left-hander David Parkinson, whose combined 1.45 ERA in 124 1/3 innings for Lakewood and Clearwater led all minor-leaguers. Two pitchers who had big seasons last year for Lakewood head the pitching staff for the Threshers. Right-hander Spencer Howard and lefty Kyle Young are the Phillies’ No. 5- and No. 17-ranked prospects, respectively, according to MLB Pipeline. Howard struck out 147 and walked 40 in 112 innings for the BlueClaws. He was 9-8 with a 3.78 ERA. Howard was a second-round draft choice in 2017 out of Cal Poly San Luis Obispo. The 6-10, 205-pound Young was limited to 59 1/3 innings last year because of elbow inflammation. He pitched for the Gulf Coast League Phillies, Williamsport and Lakewood. A 22nd-round draft choice in 2016 out of St. Dominic High in Oyster Bay, N.Y., Young will turn 22 in December. Center fielder Simon Muzziotti, who won’t turn 21 until December, is the youngest and among the most exciting prospects for the Threshers. He is the Phillies’ No. 12 prospect according to MLB Pipeline. Muzziotti played six games in the Gulf Coast League and then batted .263 and stole 18 bases in 68 games for Lakewood. Second baseman Daniel Brito began last season at Lakewood and ended at Clearwater, where he played 27 games. Brito and catcher Rodolfo Duran are defensive whizzes. Duran, 21, threw out 41.9 percent of attempted basestealers for Lakewood. The No. 19 Phillies prospect according to MLB Pipeline, Duran also showed good pop with 18 home runs in 311 at-bats for the BlueClaws. The BlueClaws will feature two of the best young position players in the Phillies’ system. At third base will be Alec Bohm, the No. 3 overall pick in last year’s draft out of Wichita State and the Phillies’ No. 1 prospect, according to MLB Pipeline. After seven games in the Gulf Coast League, Bohm struggled at Williamsport, a short-season class A team, where he batted .224 with no home runs in 107 at-bats. The 6-5, 225-pound Bohm is expected to be a power hitter after hitting 16 home runs last year for Wichita State. Next to Bohm in the infield is shortstop Luis Garcia, a switch-hitter who won’t turn 19 until October. He led the Gulf Coast League last season with a .369 average and was third with a .433 on-base percentage. Ranked the Phillies’ No. 4 prospect by MLB Pipeline, Garcia got to appear in a spring training game with the Phillies against the Pittsburgh Pirates. Catcher Rafael Marchan (5-9, 170) was a New York-Penn League All-Star after hitting .301 at short-season Williamsport last year. Marchan, 20, has a strong arm. He threw out 29.4 percent of runners last season. Francisco Morales, 19, a 6-4, hard-throwing right-hander, will lead the BlueClaws pitching staff. He had a 5.27 ERA last year at Williamsport, striking out 68 and walking 33 in 56 1/3 innings over 13 starts.